Glad to be a Girl: Viva Mental Health Days! So I'm back after my mental health day yesterday :) I normally never do that sort of thing, I'm a good girl. I have serious eldest-child syndrome and ordinarily wouldn't do things like that ... but hey, why not? There's not been much going on at work and I needed one of those days just to chill out and laze in bed and get some stuff done. Stuff I never seem to find the time on weekends to do. So I had a relaxed Tuesday evening with some delish Ghazal's take-out and spent Wednesday morning in bed with my book. Then watched a little Grey's and went for lunch at Mochacho's with Varen. After that I got my car looked at again. Thankfully the leaking oil had stopped but the little flashing oil light would not switch off. Apparently I needed a different width valve or something. I got it this morning and would like to say a *huge* thanks to Dion at the Garden Service Centre on Hans Strydom! You saved my car, man. Then I went to get my long over-due snail mail at the currently most chaotic centre in Joburg, Benmore. Bean's got another speeding fine :P And then went off on a mission for my fish. Do you have a treasure-chest and a pirate ship and skulls and other cool stuff at the bottom of your fishtank?? @wiggly - no way man! 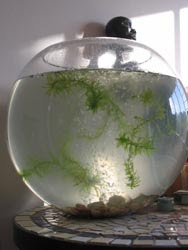 This is an aestheticly pleasing fish tank, not a kitsch one ;) I will attempt to take an updated pic of it this evening! There is an old pic here. @pant - yes I know, it is very exciting ;) I can't believe the dear has managed to keep the location a secret for the last few weeks!